“A New Method of Macarony Making, as Practised at Boston,” print, circa 1774. 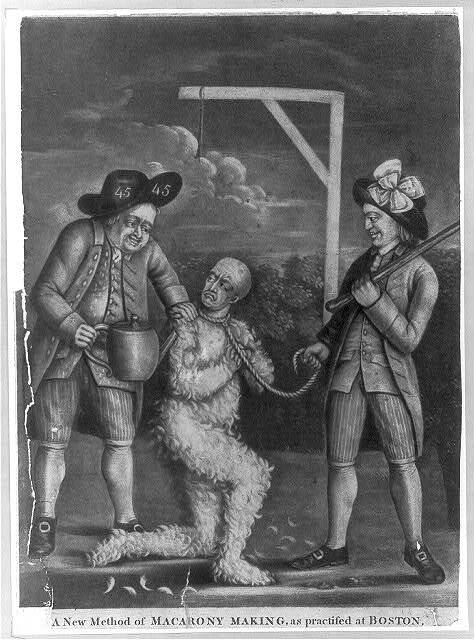 Print shows two men tarring and feathering a British customs officer and forcing him to drink tea. The man holding the teapot is wearing a hat with number 45 on it, a symbol referring to the John Wilkes case of 1763. The other man is holding a noose and carrying a club. The large bow in his hat indicates his membership in the Sons of Liberty. Published August 13, 2016 at 475 × 640 in The Sons of Liberty: Who Were They and What Did They Do?.